Dagnabbit!! Little did I know, the attractive white-tipped moth with its lovely dusty blue wings and reddish-orange thorax flitting around in my garden, would one day return and be the culprit who invades and devours the all-season source of color - the Snowbush, (Breynia distichia). It has taken me several years to get the transplanted Snowbush with their self-seeding selves to grow to a decent height, to bear full fluffy heads with perpetual new growth of dark pink on maroon stems. Leaves eventually turn a mottled mix of green, gray, white and soft pink even producing the cutest and smallest flower of light green that emerges inconspicuously and hangs below the colorful leaves from somewhat zig-zag branches. Striking is the marbled foliage always providing a beautiful visual until one day I find caterpillar larva known as the Snowbush Spanworm that comes to be from salmon colored eggs, which I have yet to find they are so gosh darn small. 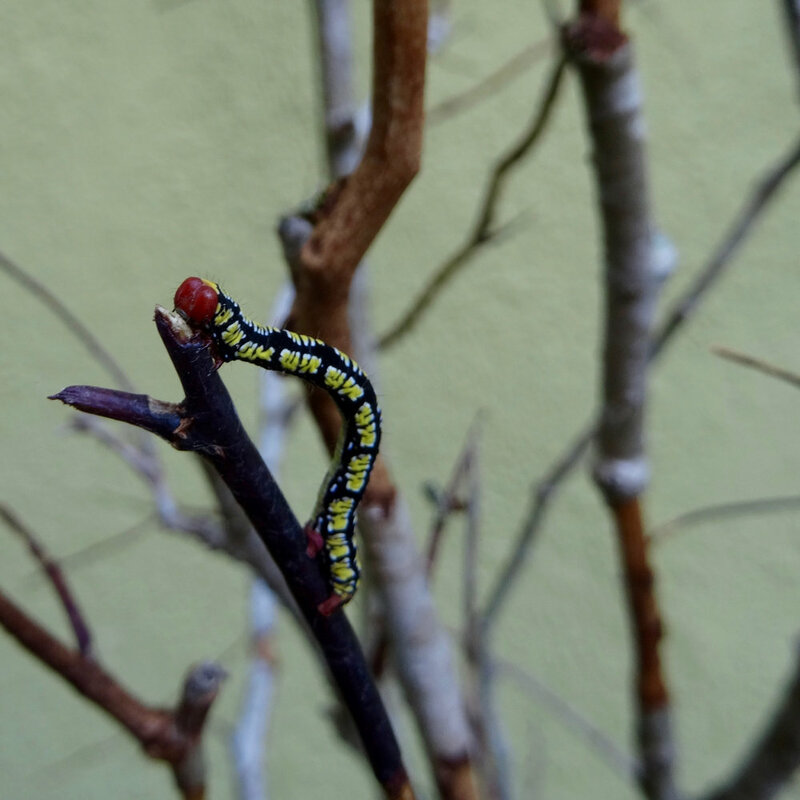 From the inchworm family of moths, the small skinny caterpillars with their yellow body embellished with black stripes apparently have been devouring the colorful masses scattered throughout the backyard, some in as little as one night. Voracious eaters the Snowbush Spanworm is. So much so, after finishing off every single leaf they go to munching on the bark that will, more then likely I am told, kill the branches and possibly the entire plant if one does not get their spanworm under control. Apparently I am a bit late. Taking a closer look it appears there is no salvaging any Snowbush in my yard. While tending to the damage and much to my surprise, I managed to find a lone surviving Snowbush on the opposite side of the yard that has yet to show any signs of spanworm destruction. Anyone experience a Snowbush Spanworm invasion? What did you use to rid the madness from this destructive pest so that I might save the lone surviving Snowbush?